The Airborne Launch Control System (ALCS) provides a survivable launch capability for the United States Air Force's LGM-30G Minuteman III intercontinental ballistic missile (ICBM) force. The ALCS is operated by airborne missileers from Air Force Global Strike Command's (AFGSC) 625th Strategic Operations Squadron (STOS) and United States Strategic Command (USSTRATCOM). The weapon system is located onboard the United States Navy's E-6B Mercury, which serves as USSTRATCOM's "Looking Glass" Airborne Command Post (ABNCP). The ALCS crew is integrated into the ABNCP battle staff and is on alert around-the-clock. Train-mobile Minuteman ICBM testing underway. In 1962, when the Minuteman ICBM was first placed on alert, the Soviet Union did not have the number of weapons, accuracy, nor significant nuclear yield to completely destroy the Minuteman ICBM force during an attack. However, Strategic Air Command (SAC) planners knew it was only a matter of time before the Soviets could have such capability. Early on, the Air Force experimented with using trains to make the Minuteman ICBMs mobile, and therefore more survivable. However, the Air Force decided to scrap the mobile Minuteman ICBM concept and emplace Minuteman in 1000 missile silos along with their 100 associated LCCs. Each facility was spread out several miles apart from each other so that the Soviets could not destroy multiple sites with just one nuclear warhead. Starting in the mid-1960s, the Soviets began to gain parity with the US and now had the potential capability to target and successfully attack the Minuteman force with an increased number of ICBMs that had greater yields and accuracy than were previously available. Studying the problem even more, SAC realized that in order to prevent the US from launching all 1000 Minuteman ICBMs, the Soviets did not have to target all 1000 Minuteman missile silos. The Soviets only needed to launch a disarming decapitation strike against the 100 Minuteman LCCs - the command and control sites - in order to prevent the launch of all Minuteman ICBMs. Even though the Minuteman ICBMs would have been left unscathed in their missile silos following an LCC decapitation strike, the Minuteman missiles could not be launched without a command and control capability. In other words, the Soviets only needed 100 warheads to fully eliminate command and control of the Minuteman ICBMs. Even if the Soviets chose to expend two to three warheads per LCC for assured damage expectancy, the Soviets would only have had to expend up to 300 warheads to disable the Minuteman ICBM force - far less than the total number of Minuteman silos. The Soviets could have then used the remaining warheads to strike other targets they chose. Born out of an original concept to have an airborne launch capability from SAC’s Looking Glass aircraft to launch the Emergency Rocket Communication System (ERCS), SAC modified this plan to launch the entire Minuteman force from the air as well. The ERCS was an Ultra High Frequency (UHF) communications package placed on top of a Minuteman II ICBM in place of its nuclear warhead. Missile crews could record an Emergency Action Message (EAM) into the ERCS and launch the missile on a lofted trajectory broadcasting the recorded EAM below to any available strategic forces. Placed on a modified EC-135 command post aircraft and thoroughly tested, the ALCS demonstrated its capability on 17 April 1967 by launching an ERCS configured Minuteman II out of Vandenberg AFB, CA. This first test launch using the ALCS and ERCS shows the original roots of ALCS. 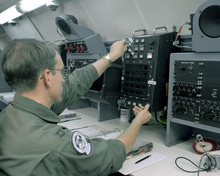 However, all Minuteman ICBM sites were modified and built to have the capability to receive commands from ALCS. After successfully demonstrating the ALCS could launch a Minuteman ICBM from the air, ALCS achieved Initial Operational Capability (IOC) on 31 May 1967. From that point on, airborne missileers stood alert with ALCS-capable EC-135 aircraft for several decades. Over the years, ALCS operations were adapted in order to ensure the most effective use of this survivable ICBM launch capability. With ALCS now standing alert around-the-clock, the Soviets could no longer successfully launch a Minuteman LCC decapitation strike. Even if the Soviets attempted to do so, EC-135s equipped with the ALCS could fly overhead and launch the remaining Minuteman ICBMs in retaliation. Now that ALCS was on alert, this complicated Soviet war planning by forcing the Soviets to not only target the 100 LCCs, but also the 1000 silos with more than one warhead in order to guarantee destruction. This would have required upwards of 3000 warheads to complete such an attack. The odds of being successful in such an attack on the Minuteman ICBM force would have been extremely low. What is more, the Soviets would have been faced with attacking the remainder of the US nuclear triad, which would have made the odds even lower. Therefore, the mission of ALCS and the nuclear triad was to deter the Soviets from launching any attack in the first place. This deterrence mission continues to this day. From 1967 to 1970, ALCS missile crews belonged to the 68th Strategic Missile Squadron (SMS) at Ellsworth AFB, SD and 91st Strategic Missile Wing (SMW) at Minot AFB, ND. ALCS equipment was installed on various EC-135 variants to include the EC-135A, EC-135C, EC-135G, and for a short while on the EC-135L. From 1967 to 1970 these aircraft belonged to the 28th Air Refueling Squadron (AREFS) at Ellsworth AFB, SD, the 906th AREFS at Minot AFB, ND, and the 38th Strategic Reconnaissance Squadron (SRS) at Offutt AFB, NE. Starting in 1970, there were only two SAC squadrons that operated ALCS-capable aircraft. This included the 2nd Airborne Command and Control Squadron (ACCS) operating EC-135C aircraft out of Offutt AFB, NE and the 4th ACCS operating EC-135A, EC-135C, and EC-135G aircraft out of Ellsworth AFB, SD. All three variants of these EC-135A/C/G aircraft had ALCS equipment installed onboard. The 4th ACCS was the workhorse of ALCS operations. Three dedicated Airborne Launch Control Centers (ALCC) (pronounced “Al-see”), designated ALCC No. 1, ALCC No. 2, and ALCC No. 3 were on ground alert around-the-clock providing ALCS coverage for five of the six Minuteman ICBM Wings. These dedicated ALCCs were mostly EC-135A aircraft but sometimes were EC-135C or EC-135G aircraft, depending on availability. ALCC No. 1 was on ground alert at Ellsworth AFB, SD and during a wartime scenario, its role would have been to take off and orbit between the Minuteman Wings at Ellsworth AFB, SD and F.E. Warren AFB, WY, providing ALCS assistance if needed. ALCCs No. 2 and No. 3 were routinely on forward deployed ground alert at Minot AFB, ND. During a wartime scenario, ALCC No. 3’s role would have been to take off and orbit between the Minuteman ICBM Wings at Minot AFB, ND and Grand Forks AFB, ND, providing ALCS assistance if needed. ALCC No. 2’s dedicated role was to take off and orbit near the Minuteman ICBM Wing at Malmstrom AFB, MT, providing ALCS assistance if needed. The 4th ACCS also maintained an EC-135C or EC-135G on ground alert at Ellsworth as the West Auxiliary Airborne Command Post (WESTAUXCP), which was a backup to SAC’s Looking Glass Airborne Command Post (ABNCP), as well as a radio relay link between the Looking Glass and ALCCs when airborne. Although equipped with ALCS, the WESTAUXCP did not have a dedicated Minuteman ICBM wing to provide ALCS assistance to. The 2nd ACCS was another major player in ALCS operations. The primary mission of the 2nd ACCS was to fly the SAC ABNCP Looking Glass aircraft in continuous airborne operations. However, due to its close proximity in orbiting over the central US, the airborne Looking Glass provided ALCS coverage for the Minuteman Wing located at Whiteman AFB, MO. Not only did Whiteman AFB have Minuteman II ICBMs, but it also had ERCS configured Minuteman missiles on alert. The 2 ACCS also had an additional EC-135C on ground alert at Offutt AFB, NE as the EASTAUXCP, providing backup to the airborne Looking Glass, radio relay capability, and a means for the Commander in Chief of SAC to escape an enemy nuclear attack. Although the EASTAUXCP was ALCS capable, it did not have a dedicated ALCS mission. For a short time in the early 1980s, one E-4B National Emergency Airborne Command Post (NEACP) also had ALCS equipment installed onboard during a test proof-of-concept program. Originally, SAC planned for a whole fleet of E-4Bs to replace all of the existing EC-135 Looking Glass aircraft in a program known as the Advanced Airborne Command Post. During the test trial, an E-4B, with a full SAC battlestaff and ALCS crew onboard, periodically flew Looking Glass missions out of Offutt AFB, NE in order to ascertain the feasibility of replacing the EC-135 fleet. In the end however, too many resources were needed and it was deemed too expensive to have the E-4B replace the EC-135. The ALCS equipment was subsequently removed from the E-4B and it continued the NEACP mission while the various EC-135s continued to perform the ABNCP and ALCC missions. Common ALCS equipment came online in 1987 so that the ALCS could be compatible with the new Peacekeeper ICBM. The Common ALCS equipment is still in use today. Needless to say, this was the heyday of ALCS operations. Around-the-clock, there were three dedicated ALCCs on ground alert, one ALCS capable Looking Glass SAC ABNCP airborne at all times, and at least two ALCS-capable Auxiliary ABNCPs on ground alert. Airborne missileers, along with all other Cold Warriors kept the peace for several decades. With the collapse of the Warsaw Pact and Soviet Union and subsequent end of the Cold War, several unfortunate events for ALCS unfolded. First, the 4th ACCS was deactivated along with the retirement of most of the EC-135 aircraft in the Air Force’s inventory. Looking Glass continuous airborne operations ceased, the Strategic Air Command was disbanded, and the 2nd ACCS was redesignated as the 7th ACCS. Even though times had changed and many were eager to cash in on the so-called “Peace Dividend” of the post-Cold War era, there were others that argued against these changes. In the end, it was impossible to stop the momentum of world events and all these changes. However, through all the turmoil, airborne missileers operating ALCS remained on alert and continued to remain vigilant, just like they always had. Although ALCS operations were no longer as wide spread as they once were with dedicated ALCCs on alert, ALCS remained on alert with the SAC and the US Strategic Command (USSTRATCOM) EC-135C ABNCPs. The Looking Glass alert posture was now a mix of both airborne and ground alert operations. Another big change to ALCS operations occurred on 1 October 1998. On this day, the Air Force’s EC-135Cs ceased to perform USSTRATCOM Looking Glass operations and was subsequently retired. The Navy’s E-6B Mercury took over USSTRATCOM’s Looking Glass mission and associated ALCS mission. Originally, the E-6A was built to perform the TAke Charge And Move Out (TACAMO) mission of relaying Emergency Action Messages to Navy Ballistic Missile Submarines in the Atlantic and Pacific oceans. However, when it was decided to retire the remainder of the Air Force’s EC-135C fleet, the E-6A was extensively modified. A battlestaff compartment was added, additional communications equipment was installed, and ALCS equipment was installed. Due to these extensive modifications, this new variant of the Mercury was redesignated from the E-6A to the E-6B. Now, whenever a USSTRATCOM battlestaff and ALCS crew are onboard, the E-6B is known as the USSTRATCOM ABNCP. E-6B Mercury. Current ALCS equipped aircraft. Today, at least one USSTRATCOM ABNCP is on alert around-the-clock. It is postured with a full USSTRATCOM battlestaff and ALCS crew onboard to perform the Looking Glass mission in the event the USSTRATCOM Global Operations Center (GOC) is incapacitated. The aircraft can take off quickly to avoid any threat. The ALCS crew onboard still provides a survivable launch capability for the Air Force’s Minuteman III ICBMs located at the three remaining Missile Wings located at Malmstrom AFB, MT; Minot AFB, ND; and F.E. Warren AFB, WY. Just like its original inception, ALCS on alert today provides an adversary with an insurmountable task of trying to destroy the Minuteman ICBM force. Even if the ground Launch Control Centers are destroyed, the USSTRATCOM ABNCP can fly overhead and the airborne missileers onboard can launch the remaining Minuteman III ICBMs. E-4B Advanced Airborne Command Post - Aircraft tail number 75-0125 performed Looking Glass on a trial basis from 1980-1981 to assess possibility of replacing EC-135 fleet. Deemed too expensive and ALCS was subsequently removed from the E-4B. Although the ALCS now resides on a Navy aircraft, the ALCS equipment is owned and operated by Air Force Global Strike Command (AFGSC). The Missile Combat Crew Commander-Airborne (MCCC-A) is always a second or third tour assignment missileer and is from the 625th Strategic Operations Squadron (STOS) located at Offutt AFB, NE. The Deputy Missile Combat Crew Commander-Airborne (DMCCC-A) is a joint USSTRATCOM position. Both ALCS crewmembers go through initial and monthly recurring ALCS training provided by the 625th STOS. This list does not contain any launches after the initial Test and Evaluation phase of the system. ^ a b c d e f g h i j k l m n o p q "ALCS Article" (PDF). Archived from the original (PDF) on 2017-07-02. Retrieved 2017-04-27. ^ a b "625th STOS Fact Sheet"